Aim: Based on the importance of coronal sealing right after endodontic treatment, this in vitro study aimed to evaluate the difference of shear bond strength to pulp chamber dentin treated with sodium thiosulfate and proanthocyanidin (PA). 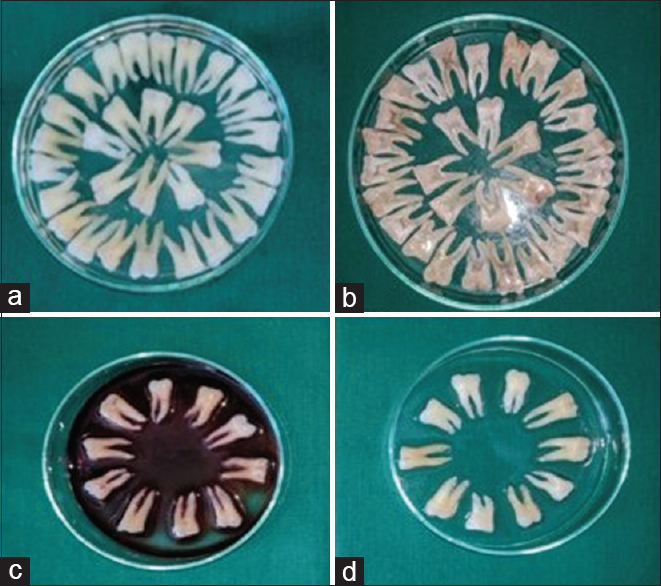 Materials and Methods: Fifteen extracted mandibular molar teeth were decoronated at the level of cementoenamel junction horizontally. The individual teeth were then sectioned mesiodistally to expose the pulp chamber dentin using a diamond disc. The specimens were randomly divided into three groups (n = 10). Group A: control group, treated with 5.25% sodium hypochlorite (NaOCl) for 30 min followed by a final rinse with 17% ethylenediaminetetraacetic acid (EDTA) solution for 3 min; Group B: after pretreatment with NaOCl and EDTA, it is further treated with 5% sodium thiosulfate (Na2S2O3) for 10 min; and Group C: after pretreatment with NaOCl and EDTA, it is further treated with 6.5% PA for 10 min. After drying the specimens, a bonding agent namely One Coat Bond SL (SwissTEC, Coltene) was applied to the pulp chamber dentin followed by a composite restoration (SwissTEC, Coltene). Each specimen was then tested under a universal testing machine at the dentin/resin interface to determine the shear bond strength. Results: Both the groups in which 5% Na2S2O3 and 6.5% PA were used for 10 min showed bond strength that was found to be statistically higher than the positive control (P < 0.05). Conclusion: The use of Na2S2O3 and PA can significantly increase the bond strength of composite resin to NaOCl/EDTA-treated dentin, allowing adhesive restorations to be immediately applied after endodontic treatment. Successful endodontic treatment relies on effective cleaning and shaping of root canal as well as creation of an apical seal. However, regardless of the materials and obturation techniques employed, root canal fillings exposed to saliva may become contaminated,, causing coronal leakage, which is a negative contributor to the prognosis of endodontic treatment., Thus, even though apical leakage is still being considered as an important factor of endodontic failure, in the last few years, more focus has been given to procedures performed to achieve an effective coronal sealing soon after the completion of root canal filling. The immediate sealing of endodontically treated teeth using restorative materials is very important in preventing early coronal leakage,, and is associated with healthy apical tissues.,, Composite resin-based materials have been suggested for the restoration of nonvital teeth because of their benefits such as bonding to dentin by hybrid layer formation and reducing marginal leakage., Moreover, teeth restored with resin composite have been shown to exhibit better fracture resistance than those restored with amalgam,, as the physico-mechanical properties of resin composites are closer to those of dentin. Grape seed extract (GSE) is a naturally occurring antioxidant. It contains oligomeric proanthocyanidin (PA) complexes (OPCs). PAs have free radicle scavenging activity, antibacterial, antiviral, anti-cariogenic, anti-inflammatory, anti-allergic properties, and vasodilatory action. Type I collagen in dentin forms a rigid, strong, space-filling biomaterial which is essential for many structural roles such as scaffolding for mineralization and viscoelasticity. PAs cause hydroxylation of proline which is an essential step of collagen biosynthesis, thereby stabilizing and increasing the cross-linking of Type I collagen fibrils. This intermolecular cross-linking is a prerequisite for viscoelasticity, stability, and tensile strength of collagen fibrils. This strengthening of collagen fibrils leads to increased mechanical properties and decreased enzymatic degradation and is a significant step in adhesive dentistry which can be achieved by cross-linking agents such as PAs. Another antioxidant/reducing agent which may reverse the NaOCl-compromised dentin bonding is sodium thiosulfate (Na2S2O3). Na2S2O3, being a potent antioxidant, has some potential to neutralize the oxidizing agents through redox reaction of the NaOCl-treated surface. This in turn facilitates complete polymerization of resin-bonding material., It can react with oxidants to form a stable product by neutralizing unpaired electrons. Thus, Na2S2O3 can be used to recover the lost bond strength of NaOCl-treated dentin. The purpose of this study was to determine the microtensile shear bond strength of pulp chamber dentin to composite resin material after pretreatment of exposed dentin with Na2S2O3 and PA with the null hypothesis that there is no significant difference existing between the tested groups. Endodontic treatment and final restoration cannot be regarded as separate modalities because both are elements of a single concept called endodontic restorative continuum. Adjustment of the adhesive system to the irrigating solution may lead to more predictable treatment outcomes, but in this study, depending on the concentration and time application, the use of Na2S2O3 and PAs can recover the bond strength to dentin. The null hypothesis was that pretreatment of dentin with neither PA nor Na2S2O3 would be effective in reversing the bond strength to dentin compromised by NaOCl. Fifteen extracted mandibular molar teeth were sectioned in a mesiodistal orientation using a circular diamond disc to give a total of thirty sectioned samples. The samples were then randomly divided into three groups of ten samples each. Initially, all the sectioned samples were immersed in a solution of 3% NaOCl solution [Figure 1]a for 30 min, with the solution being renewed every 10 min. The samples were then irrigated and cleaned with saline. Any remaining pulpal tissue was removed with a spoon excavator. After treatment with NaOCl, all the samples were then immersed in a solution of 17% ethylenediaminetetraacetic acid (EDTA) for 3 min [Figure 1]b. The samples were then irrigated and cleaned with saline. After this pretreatment of all the samples, they were randomly divided into three groups. Group A was a positive control group comprising of ten samples which were only treated with NaOCl and EDTA. Group B (n = 10) consisted of samples which were treated with NaOCl and EDTA, and then immersed in a solution of 5% Na2S2O3 for 10 min [Figure 1]d. The third group, Group C (n = 10), consisted of samples which were treated with NaOCl and EDTA, and then immersed in a solution of 6.5% PA for 10 min [Figure 2]c. All the time periods were assessed with a timer. The sectioned samples were then blot dried using cotton pellets. Each sample was then etched with 37% phosphoric acid for 20 s. All the samples were coated with One Coat SL (Coltene, Switzerland) bonding agent using a micro applicator tip (Dentsply) and were cured for 20 s. After the application of the bonding agent, each sample received a packable composite resin (SwissTEC, Coltene) built upon the treated and exposed dentinal surface of the tooth. The composite resin material was placed incrementally, where each increment was of 1 mm thickness. Two such increments were placed with successive curing of each increment with a light-curing unit (Woodpecker (Artspa industrial company limited, Foshan, Guangdong)) for 20 s. After the bonding procedure, the samples were stored in distilled water until testing. For testing, the samples were embedded in a cylindrical acrylic mold and were then tested for microtensile shear bond strength of the composite resin to the tooth surface which was pretreated with NaOCl, EDTA, Na2S2O3, and PA. Each sample was individually tested and was subjected to a tensile load in a universal testing machine at a crosshead speed of 1 mm/min until failure. Mixed: Fracture of the composite resin material itself and partial or complete de-attachment from the tooth–resin interface [Figure 2]c.
The microtensile bond strength means and standard deviations are shown in [Table 1]. Statistical analysis revealed that Group A (control group) with NaOCl + EDTA showed a significantly lower bond strength to pulp chamber dentin (P < 0.05). Conversely, the experimental groups immersed in 5% Na2S2O3 (Group B) showed higher values than the group immersed in 6.5% PA (Group C), but the difference was not statistically significant. Stereomicroscopic analysis of the mode of failure revealed that cohesive failures were maximum with Group B followed by Group C. Adhesive mode of failure was least in Group B followed by Group C, showing statistically significant results [Table 2]. The methodology was adjusted to evaluate the bond strength achieved by adhesive procedures performed on the buccal and lingual walls of the intracoronary dentin, which is the area fully affected by chemical substances during endodontic treatment. This study is one of the few evaluating the resin bond strength to dentin pulp chamber after the use of typical endodontic substances, and it was performed to assess the applicability of Na2S2O3 and PAs to recover the dentin bond strength lost with the use of these products. The null hypothesis, which held that using Na2S2O3 and PAs would not be effective to recover the compromised bond strength after the use of NaOCl, was not validated. On the other hand, an antioxidant/reducing agent (e.g., PA and Na2S2O3) may reverse the NaOCl-comprised dentin bonding. Na2S2O3 is a potent inorganic antioxidant and is used for treatment in cases of cyanide poisoning. PAs are also called condensed tannins, are basically oligomers and polymers of monomeric flavonoids. These secondary plant metabolites also possess substantial antioxidant activity., Na2S2O3 and PA have potential to neutralize the oxidizing agents through redox reaction of the treated substrate, thus facilitating complete polymerization of resin-bonding materials., Furthermore, they can react with oxidants to neutralize unpaired electrons by relatively easy release of protons and form a stable product. Na2S2O3 has been used in many microbiology studies to neutralize NaOCl,, including clinical studies, showing biocompatibility. An initial cytotoxic assessment of Na2S2O3 in contact with fibroblastic cells has been performed by means of the methyl-thiazolyl-diphenyl tetrazolium bromide assay, the results of which show that concentrations of 0.5% and 5% are compatible with cell viability, suggesting a great potential for routine clinical use. On the other hand, PAs are natural extracts and therefore lack toxicity. They are known to stabilize and increase the cross-linkage of Type-1 collagen fibrils. They have been reported to produce exogenous cross-links. The interaction between PAs and collagen fibrils involves the formation of complexes that are primarily stabilized by hydrogen bonding between the carbonyl and hydroxyl functional groups of amide linkages and phenols, respectively. They are theoretically known to counter the oxygen inhibition layer and thus ensure complete polymerization. GSE, which has been used in the current study, mainly comprises of OPCs. These OPCs are made up of dimers and trimers of catechins and epicatechins.,, Esterification of these two occurs in the presence of gallic acid. This process is mainly responsible for increasing their free radical scavenging ability. (Gallic acid is found only in GSE.) Xie et al. reported that at a controlled pH of 7.4, GSE positively affected the demineralization of artificial root caries. Microtensile bond strength allows bond testing of small areas, promoting a better stress distribution throughout the specimen, and induces failure of materials that are closer to their true ultimate strengths and are mostly adhesive failures. On comparison of shear bond strength of composite resin to pulp chamber dentin, it was seen that the mean shear bond strength of samples treated with 5% Na2S2O3 for 10 min was maximum as compared to 6.5% PA (P < 0.05, significant). Cho and Dickens reported that acetone in bonding agents results in poor wetting of dentin surface and incomplete penetration of hybrid layer. Furthermore, the residual acetone may lead to pores that can act as flaw-initiating sites during debonding. Acetone used during the extraction of PAs can be a confounding factor, resulting in lower shear bond strength. Postuniversal testing, the samples obtained were examined under a stereomicroscope for mode failures. On assessment, minimum adhesive failures of composite resin to pulp chamber dentin were seen in samples of Group B. These findings complied with the results in [Table 1]. Among all the three groups, maximum cohesive failures were again seen with Group B, but the findings were not statistically significant. An equal number of samples presented with mixed failures in Group B and Group C. Hence, the null hypothesis was rejected as there is significant difference existing between the tested and control groups. Endodontic treatment and final restoration cannot be regarded as separate modalities because both are elements of a single concept called endodontic restorative continuum. Adjustment of the adhesive system to the irrigating solution may lead to more predictable treatment outcomes, but in this study, depending on the concentration and time application, the use of Na2S2O3 and PAs can recover the bond strength to dentin. Shipper G, Trope M. In vitro microbial leakage of endodontically treated teeth using new and standard obturation techniques. J Endod 2004;30:154-8. Ray HA, Trope M. Periapical status of endodontically treated teeth in relation to the technical quality of the root filling and the coronal restoration. Int Endod J 1995;28:12-8. Hommez GM, Coppens CR, De Moor RJ. Periapical health related to the quality of coronal restorations and root fillings. Int Endod J 2002;35:680-9. Belli S, Zhang Y, Pereira PN, Pashley DH. Adhesive sealing of the pulp chamber. J Endod 2001;27:521-6. Belli S, Zhang Y, Pereira PN, Ozer F, Pashley DH. Regional bond strengths of adhesive resins to pulp chamber dentin. J Endod 2001;27:527-32. Galvan RR Jr., West LA, Liewehr FR, Pashley DH. Coronal microleakage of five materials used to create an intracoronal seal in endodontically treated teeth. J Endod 2002;28:59-61. Gomes AC, Nejaim Y, Silva AI, Haiter-Neto F, Cohenca N, Zaia AA, et al. Influence of endodontic treatment and coronal restoration on status of periapical tissues: A Cone-beam computed tomographic study. J Endod 2015;41:1614-8. Ausiello P, De Gee AJ, Rengo S, Davidson CL. 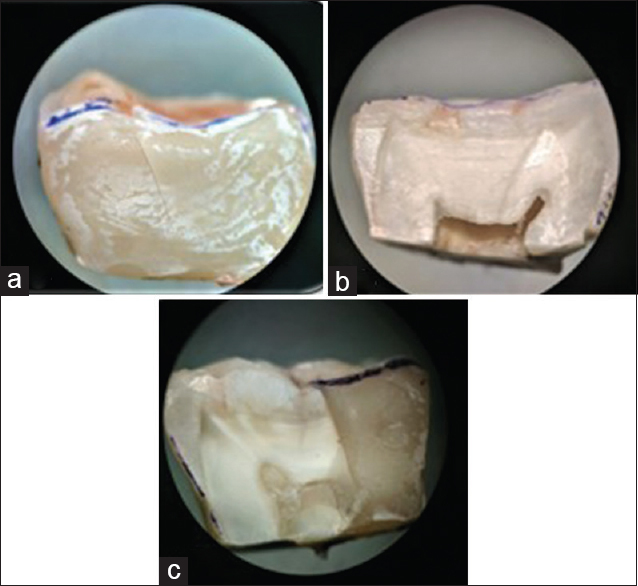 Fracture resistance of endodontically-treated premolars adhesively restored. Am J Dent 1997;10:237-41. Trope M, Langer I, Maltz D, Tronstad L. Resistance to fracture of restored endodontically treated premolars. Endod Dent Traumatol 1986;2:35-8. Coelho CS, Biffi JC, Silva GR, Abrahão A, Campos RE, Soares CJ, et al. Finite element analysis of weakened roots restored with composite resin and posts. Dent Mater J 2009;28:671-8. Moreira DM, Almeida JF, Ferraz CC, Gomes BP, Line SR, Zaia AA, et al. Structural analysis of bovine root dentin after use of different endodontics auxiliary chemical substances. J Endod 2009;35:1023-7. Santos JN, Carrilho MR, De Goes MF, Zaia AA, Gomes BP, Souza-Filho FJ, et al. Effect of chemical irrigants on the bond strength of a self-etching adhesive to pulp chamber dentin. J Endod 2006;32:1088-90. Farina AP, Cecchin D, Barbizam JV, Carlini-Júnior B. Influence of endodontic irrigants on bond strength of a self-etching adhesive. Aust Endod J 2011;37:26-30. Morris MD, Lee KW, Agee KA, Bouillaguet S, Pashley DH. Effects of sodium hypochlorite and RC-prep on bond strengths of resin cement to endodontic surfaces. J Endod 2001;27:753-7. Lai SC, Mak YF, Cheung GS, Osorio R, Toledano M, Carvalho RM, et al. Reversal of compromised bonding to oxidized etched dentin. J Dent Res 2001;80:1919-24. Vongphan N, Senawongse P, Somsiri W, Harnirattisai C. Effects of sodium ascorbate on microtensile bond strength of total-etching adhesive system to NaOCl treated dentine. J Dent 2005;33:689-95. Weston CH, Ito S, Wadgaonkar B, Pashley DH. Effects of time and concentration of sodium ascorbate on reversal of NaOCl-induced reduction in bond strengths. J Endod 2007;33:879-81. Prasansuttiporn T, Nakajima M, Kunawarote S, Foxton RM, Tagami J. Effect of reducing agents on bond strength to NaOCl-treated dentin. Dent Mater 2011;27:229-34. Castellan CS, Pereira PN, Viana G, Chen SN, Pauli GF, Bedran-Russo AK, et al. Solubility study of phytochemical cross-linking agents on dentin stiffness. J Dent 2010;38:431-6. Aruoma OI, Cuppett SL. Antioxidant Methodology: In Vivo and In Vitro Concepts. Champaign, IL: AOCS Press; 1997. Sim TP, Knowles JC, Ng YL, Shelton J, Gulabivala K. Effect of sodium hypochlorite on mechanical properties of dentine and tooth surface strain. Int Endod J 2001;34:120-32. Rueggeberg FA, Margeson DH. The effect of oxygen inhibition on an unfilled/filled composite system. J Dent Res 1990;69:1652-8. Beecher GR. Proanthocyanidins: Biological activities associated with human health. Pharmaceut Boil 2004;42:2-20. Wang H, Cao G, Prior RL. Oxygen radical absorbing capacity of anthocyanins. J Agric Food Chem 1997;45:304-9. Gomes BP, Martinho FC, Vianna ME. Comparison of 2.5% sodium hypochlorite and 2% chlorhexidine gel on oral bacterial lipopolysaccharide reduction from primarily infected root canals. J Endod 2009;35:1350-3. Rôças IN, Siqueira JF Jr. Comparison of the in vivo antimicrobial effectiveness of sodium hypochlorite and chlorhexidine used as root canal irrigants: A molecular microbiology study. J Endod 2011;37:143-50. Han B, Jaurequi J, Tang BW, Nimni ME. Proanthocyanidin: A natural crosslinking reagent for stabilizing collagen matrices. J Biomed Mater Res A 2003;65:118-24. Cecchin D, Farina AP, Bedran-Russo AK. The effects of endodontic substances and naturally reducing agents on the bond strength of epoxy resin-based sealer to root dentin. J Conserv Dent 2017;20:302-6. Boteon AP, Kato MT, Buzalaf MAR, Prakki A, Wang L, Rios D, et al. Effect of proanthocyanidin-enriched extracts on the inhibition of wear and degradation of dentin demineralized organic matrix. Arch Oral Biol 2017;84:118-24. Ricardo da Silva J, Rigaud J, Cheynier V, Cheminat A, Moutounet M. Procyanidin dimers and trimers from grape seeds. Phytochem 1991;30:1259-64. Romeyer F, Macheix J, Sapis J. Changes and importance of oligomeric procyanidins during maturation of grape seeds. Phytochem 1986;25:219-21. Xie Q, Bedran-Russo AK, Wu CD. In vitro remineralization effects of grape seed extract on artificial root caries. J Dent 2008;36:900-6. Sano H, Shono T, Sonoda H, Takatsu T, Ciucchi B, Carvalho R, et al. Relationship between surface area for adhesion and tensile bond strength – Evaluation of a micro-tensile bond test. Dent Mater 1994;10:236-40. Pashley DH, Sano H, Ciucchi B, Yoshiyama M, Carvalho RM. Adhesion testing of dentin bonding agents: A review. Dent Mater 1995;11:117-25. Cho BH, Dickens SH. Effects of the acetone content of single solution dentin bonding agents on the adhesive layer thickness and the microtensile bond strength. Dent Mater 2004;20:107-15. Yurdagüven H, Tanalp J, Toydemir B, Mohseni K, Soyman M, Bayirli G, et al. The effect of endodontic irrigants on the microtensile bond strength of dentin adhesives. J Endod 2009;35:1259-63.